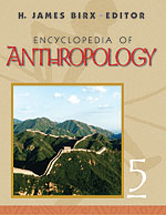 Encyclopedia of Anthropology is a unique collection that focuses on topics in physical/biological anthropology, archaeology, cultural/social anthropology, linguistics, and applied anthropology. Also included are relevant articles on geology, paleontology, biology, evolution, sociology, psychology, philosophy, and theology. Special attention is given to hominid evolution, primate behavior, genetics, ancient civilizations, cross-cultural studies, social theories, and the value of human language for symbolic communication.